Here we are in the middle of the third full week of school — a good time to check in on Mr. Bill’s kindergarten class! I know how exhausting the first few weeks are for teachers (and children!). I wanted to be unobtrusive and give Bill some ‘space’ to get his classroom routines going so I decided not to visit for another week or two. In the meanwhile, I spoke with Bill and asked him if he has been able to get the inquiry study off the ground. The children, as we predicted, came in to class on the first day excited about the playground study and eager to share their summer playground stories. They brought in pictures that they drew at home and made some in class. Bill invited the children to paste their pictures together to create a mural, and used this group playground montage as a jumping off point for starting the playground inquiry project. Bill realized that, at this point in the year, it’s not easy to involve 24 four and five year olds in a complex class discussion. 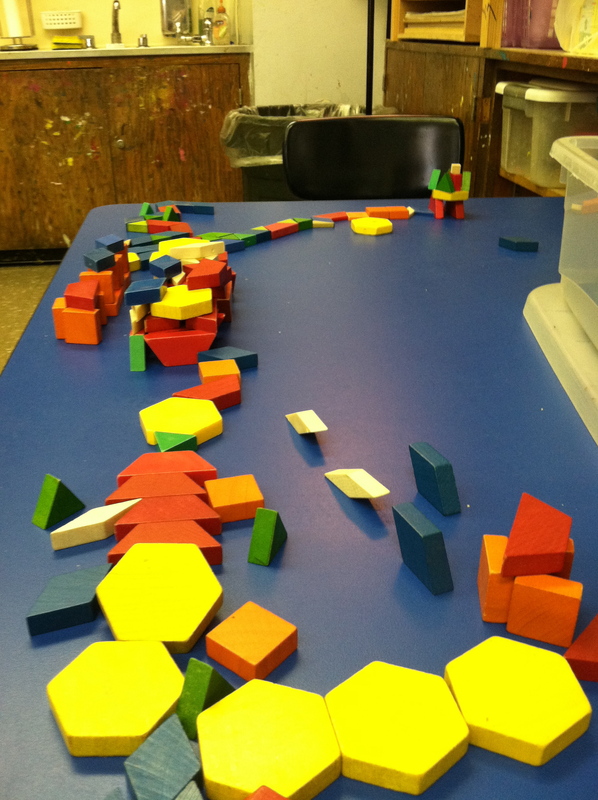 He decided to see what would happen if children were given pattern blocks and encouraged to create pattern-block playgrounds. At first the children worked individually. The class enjoyed this and began giving names to their structures. Bill said that some of their names were “the swing park”, “the hiding place” or “the sandbox”. When they were midway through their activity he stopped them and began a discussion about fences, entryways and connecting pathways. 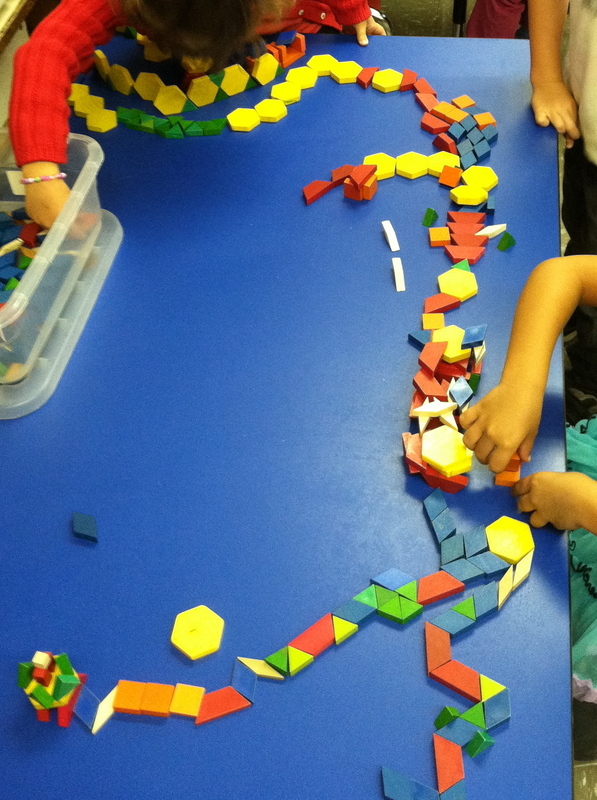 This class talk encouraged the children to bring their individual playgrounds together to create larger structures, leading the way towards collaborative work, imaginative pretend play and conversation! Another ‘perk’ is that the children were also becoming familiar with one of their new math manipulatives. Tomorrow, Bill and I will meet to look over the children’s work samples, assess what they understand and misunderstand about playgrounds, and wonder about where their interests might lead. I’m going to suggest that we work out an anticipatory planning web. We can brainstorm all of the possibilities for this playground study, thinking of concepts, activities, trips, visiting experts, types of assessments that would be most informative, etc. 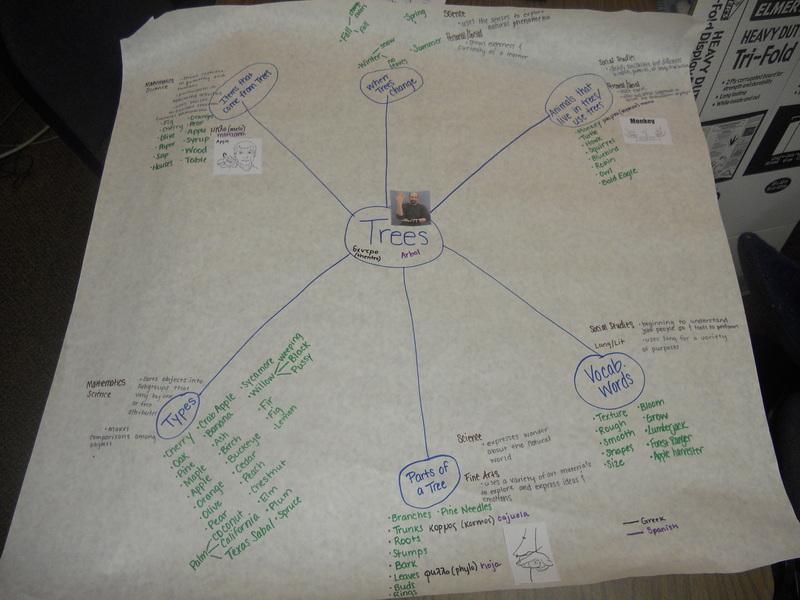 This web gives the teacher a sense of what direction the study might go in and is very helpful in planning for the inquiry explorations. I’ve seen these webs done in a variety of ways. 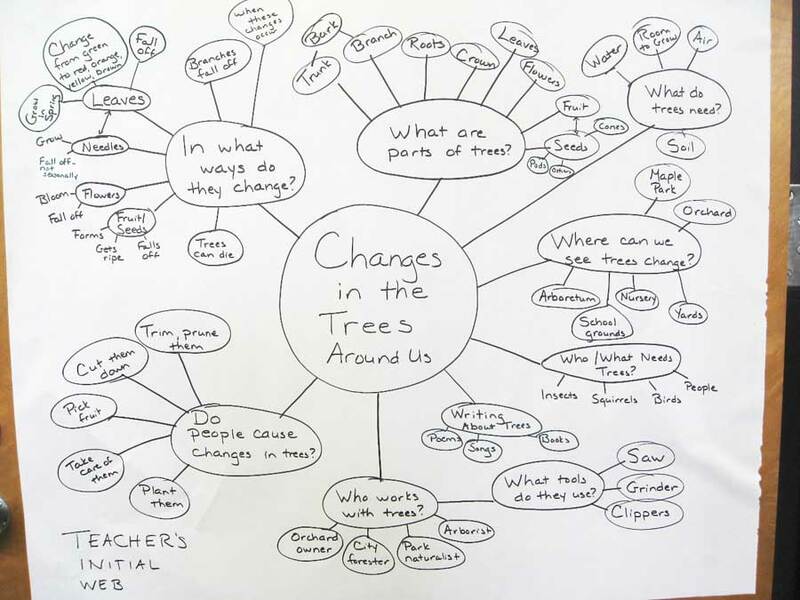 One example that I found at the Sauchildrenscampus site shows a web for a Tree Study made by a teacher and her assistant teacher. The web, in this case, is broken up into six categories: Parts of a Tree; Vocabulary Words; Animals that Live in Trees and Use Trees; When Trees Change; Items that Come from Trees; Types of Trees. Because the web is preparation for an inquiry study, I personally prefer starting out the web with questions, anticipating what questions children might pose. On the Illinois Projects in Practice site, there is a sample Tree Study web that begins with possible questions. 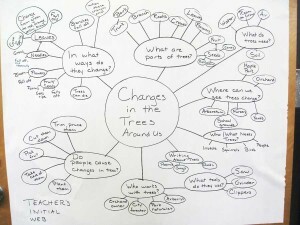 They are: In what ways do trees change? ; What are the parts of trees? ; What do trees need? ; Where can we see trees change? ; Who/What needs trees? ; What tools do they use? ; Who works with trees? ; Do people cause changes in trees? ; What writing is there about trees? After tomorrow’s meeting with Bill, I’ll update you on what is happening in the kindergarten playground study! 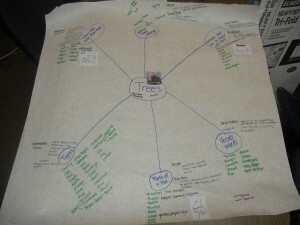 This entry was posted in Investigating Choice Time: Inquiry, Exploration, and Play and tagged anticipatory web; tree study; mural;pattern blocks on September 28, 2011 by Renee. Thanks, Bill and Rene. I’m eagerly awaiting the next installment. Hi John. Bill and I met after school on Wednesday and worked on a planning web and a weekly schedule. He’s so thoughtful and ready to be flexible if it’s for the good of the children! It’s so early in the school year and yet at 3:30, after the children have gone home, evidence of their presence is all over the room! I’m looking forward to visiting his room during Choice Time next month. Thank you for offering this deeply thoughtful and inspired blog. I do have thoughts about your lightbox differences, in ‘Visiting with Mr. Bill,’ though they may seem quite obvious. Teachers’ classroom provisioning is a creative process, serving varied goals. I see the lightbox as an important tool, in it’s infinite possibilities. Your open array of materials leaves room for innovative investigation. Bill’s activity serves another purpose, which is creative in a restorative way, from the way the children describe it. I see this choice as a ‘sorbet between courses’ activity. Innovation and rest are both crucial in a balanced learning diet. 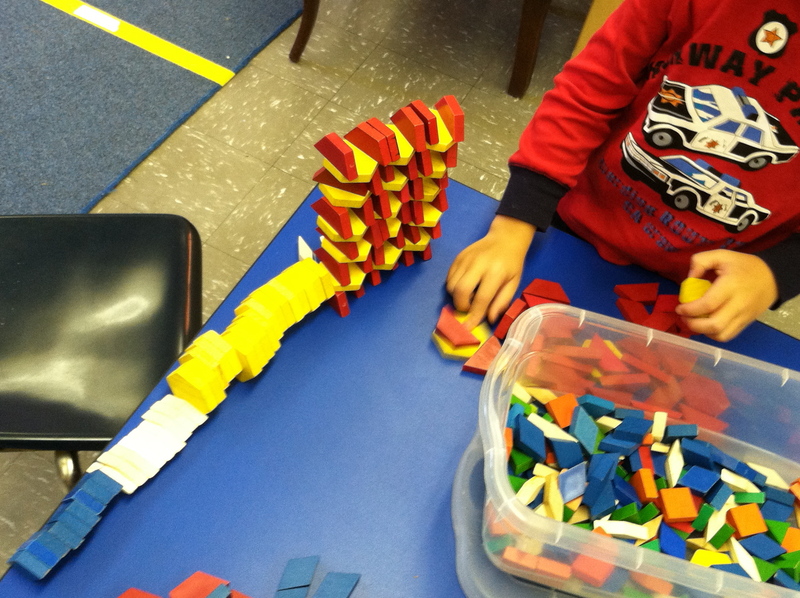 I see that leaving it open, with both kinds of materials, can serve the varied needs of the children. But even if Bill chooses to limit his materials to magazine sheets, there will be a child who comes to Bill’s activity, and decides to rip the paper. This will begin a new trend.